The first diffraction ring on the primary of this close double appeared to fall just short of bisecting the center of its companion. I estimated a separation of 1.4 arc seconds; however, Brian Workman's Double Star Calculator gives 1.78 arc seconds. My PA measurement worked out to 268 degrees, which compares well with the calculated PA of 266 degrees. Color was pretty difficult to pick up, but appeared to be pale yellow and pale blue. how big are these stars? The spectral type of both stars is 'A', but it seems that the luminosity class (I - V) is not given in most tables. One source (Catalogue of Stellar Spectral Classifications (Skiff, 2009)) tends to give V to the primary and possible the secondary, indicating that they are likely to be main sequence stars. If that's the case, then each star may be about 2.5 times the diameter of the sun. 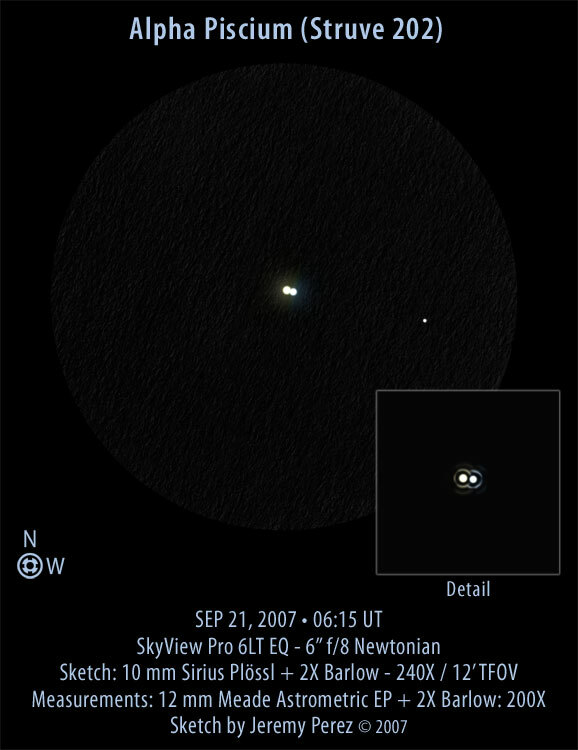 A nice reference can be found here at Zoom Astronomy. What does the separation MEAN? Is that AU? If not, do we know how far apart those stars are? And would it be safe to say they're about the same distance apart as Sol & Jupiter? When describing double star measurements, "separation" is an angular unit, which doesn't actually describe how far apart they really are in space. To start with, an angular distance describes a measurement on the celestial sphere. If you slice a circumference around the celestial sphere, you can divide it into 360 degrees. Each degree can be divided into 60 arc minutes (noted by the ' symbol). Each arc minute can be divided into 60 arc seconds (noted by the " symbol). Most double star separations can be measured in arc seconds. For example Alpha Piscium is about 1.8 arc seconds. Next, you need to figure out how far away the stars are from us. The further away they are, the greater 1.8 arc seconds will amount to. I have not researched distance data for Alpha Piscium, but if Wikipedia is accurate, this pair is 42.6 parsecs (139 light years) away. If you can assume that both stars are the same distance from Earth, you can use that distance to figure out their true separation in space. In the simplest case that they are both the same distance from Earth, and 42.6 parsecs is accurate, then they would be separated by over 11.5 billion kilometers. Unfortunately it's unlikely to be that simple. Depending on the geometry of their orbit, one star is likely to be closer to us than the other, which means they could actually be separated by a much greater distance. The only way to know is to precisely measure them over a number of years and see how their angular separation and position angle change with time. This will allow an orbit to be calculated. Once that happens, it becomes possible to calculate their true distance mathematically. An orbit has been indeed been calculated for this binary, but it would take a bit more research than I'm able to invest right now to determine what those values actually are. In any case, that's the long answer to what the separation data means. They are at least 11.5 billion kilometers apart (by comparison, Neptune averages 4.5 billion kilometers from the sun). However, they are likely to be separated by a significantly greater distance depending on how both stars are positioned relative to the Earth. I hope that helps a little. Thanks for posing the question. I note you list PA ~ 270deg. AL dbl star list has it as 50deg, which I think is wrong. Your site agrees with other info, so I'm more confident in saying AL list is wrong. Thanks for noticing that. It's easy for errors to creep into observing lists loaded with numbers. The WDS lists 269 degrees for 2009. I've emailed a correction request to the club coordinator. This page contains a single entry by Jeremy Perez published on September 25, 2007 11:32 PM. Zeta Piscium (Struve 100) was the previous entry in this blog. Gamma Ceti (Struve 299) is the next entry in this blog.